Low toxicity alternative to traditional artists’ solvents reducing exposure to the more harmful compounds associated with turpentine, etc. Leaves no residue after evaporation. Refined aliphatic distillate of petroleum. Download this product information page as pdf. Langridge Low Toxic Solvent may be added to oil colours, drying oils and oil mediums in small quantities, used to clean dried paint films and used to clean brushes and painting equipment. It can be used as a diluent when used in small quantities with oil colours. Artists wishing to create very fluid working qualities should refer to Painting Mediums constructed for that purpose. 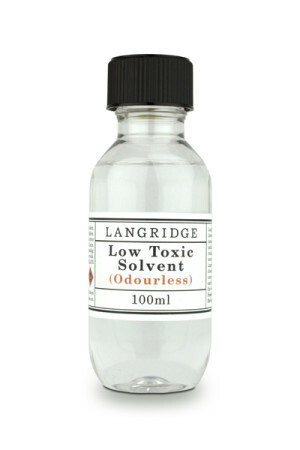 Because of its construction, Langridge Low Toxic Solvent cannot be used for the home manufacture of artists’ varnishes (natural or synthetic). Damar Resin cannot be dissolved in Langridge Low Toxic Solvent or any other petroleum distillate. For cleaning brushes Langridge recommends the use of brush cleaning units or containers which have an airtight lid. Reducing exposure to solvent fumes is advised at all times, as well as preventing evaporation of solvent in the container. Because Langridge Low Toxic Solvent has a Permissible Exposure Level (PEL) higher than other solvents, an artist’s exposure to Low Toxic Solvent will not be as harmful over the same time period in comparison to traditional solvents. (See…) Associated issues with prolonged contact with traditional artists’ solvents such as dermatitis, skin and respiratory organ irritation, headaches, etc. can be dramatically reduced or removed by using Langridge Low Toxic Solvent. Langridge still recommends the use of good studio ventilation, open windows to increase airflow and preferably a properly installed exhaust system. Langridge Artists White Spirit is a clear and transparent liquid with a virtually undetectable petroleum odour. For further washing apply a small quantity of Langridge Safe-Clean-Up or Marseille or other pure olive oil soap and massage the bristles of the brush to release any remaining White Spirit. Wash thoroughly in warm water. Leave brushes to fully dry before using for oil colours. 10ml in 55mm wide open cup at 20ºC (68ºF) ambient temperature full evaporation after 3 hours. Any airflow over the surface will evaporate the solvent more rapidly.